Securing his fifth Rally Mexico victory, Sebastien Ogier holds off Ott Tanak, cutting the points gap to just four before heading to Corsica. 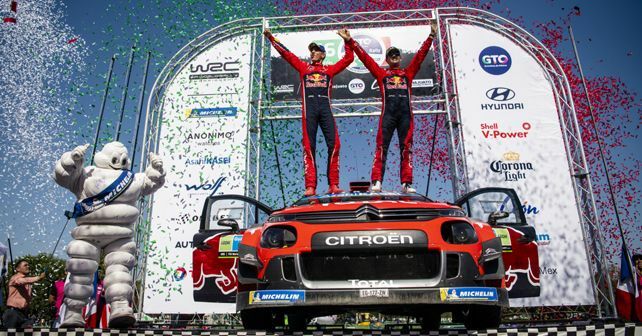 Sebastien Ogier and Julien Ingrassia (Citroen Total WRT) in rally Guanajuato Mexico exhibited no signs of slowing down, as the duo sealed their fifth Rally Mexico victory, which was also their seventh consecutive podium finish. After achieving unfavourable results in Rally Sweden last month, Ogier certainly made up the lost ground in Mexico while eating into current championship leader Ott Tanak’s (Toyota Gazoo Racing) early season advantage. The Frenchman (Ogier) is now just four points behind the Estonian (Tanak) in the overall points. ‘It’s been a tough weekend in difficult conditions. It wasn’t a trouble-free rally for us, but we managed to make the best of it and came out with maximum points,’ said the Frenchman, who also clinched maximum bonus points by winning the Wolf Power Stage by 0.025 second. Coming into the lead by the end of El Chocolate 2 (SS5), Ogier and Ingrassia only conceded the lead once to Kris Meeke and Sebastian Marshall (Toyota Gazoo Racing) at the end of Guanajuatito 1 (SS10). At the finish, Ogier headed Tanak by 30.2 seconds. Further 19.7 seconds behind the leader, Elfyn Evans and Scott Martin (M-Sport Ford WRT) claimed the final spot on the podium, improving over their fifth-place finish in Rally Sweden. Interestingly, Evans and Martin remained ahead of Tanak and Jarveoja right till SS18. However, the Estonian outgunned the Ford M-Sport duo on his final day run to clinch a second-place finish. Thierry Neuville and Nicolas Gilsoul (Hyundai Shell Mobis WRT) still seem to be struggling to find their sweet spot, as the pair finished in fourth-place. These results seem to overturn the pre-season debate, which pegged Neuville at a huge advantage in this season due to the fact that he was to drive an already-familiar i20 during the season. However, over the three rounds so far, he’s only dropped by one position after each round. In the overall championship, Neuville has dropped to third behind Ogier by six points. Meanwhile, Tanak’s teammate Kris Meeke managed to round-off the top five. After two consecutive sixth-place finishes, the Irishman went one better in Mexico. In the manufacturers’ championship, defending champion Toyota Gazoo Racing leads the pack with 86 points, followed by Citroen Total WRT with 78 points. The WRC bandwagon will now head to Corsica for the season’s first all-asphalt fixture, the Corsica Linea – Tour de Corse.